Colombia located on the northwest corner of South America and is that continents 4th largest country, takes it name from Christopher Columbus. Colombia is the second of only two South American countries that border the Pacific Ocean and the Atlantic, the other being Chile with it’s small presence in the Straits of Magellan. 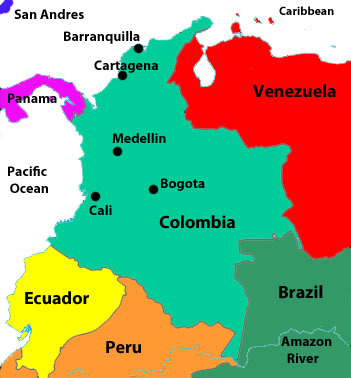 Colombia is neighbors with Venezuela to the east, Brazil to the south Peru and Ecuador to the west southwest and to the northwest Panama. To the north one will find the Atlantic Ocean blending in with the Caribbean Sea, to the west, the Pacific Ocean. Colombia’s geography varies widely from the low lands of the Pacific and Caribbean basin to the rolling hills going east to the lowlands of the Amazon basin. Starting in the east, with its border with Venezuela, the Llanos plains give way to the Andes Mountains heading west towards Ecuador to form the mountain range Cordillera Occidental. With mountain peaks reaching 13,000 feet the Cordillera Occidental mountain range gives way to the Cauca River valley, located in this valley are some of Colombia’s major cities, Bogotá, Cali and Medellin. Heading farther east from the Cauca River Valley the land rises to the impressive Cordillera Central mountain range, with several snow covered mountains, the Cordillera Central Mountains have peaks reaching above 18,000 feet. If one would travel farther southeast from the Cordillera Central Mountains one would enter the Magdalena River valley, a large navigate able artery the Magdalena River separates the mountain ranges of Cordillera Central with the mountains of Cordillera Oriental, just as impressive yet not as high as the Cordillera Central Mountains the region has large and breathtaking valleys. Continuing farther southeast the land turns to rolling hills and flat lands called the Llanos Orientals, thus the start of Colombia’s jungle covered Amazon basin. Llanos Orientals, makes up 60% of Colombia’s land mass yet is the least most populated region of the country. Colombia being located so close to the Equator, has a very constant climate. Due to the varying geographical regions of the country, Colombia has several climate regions. Tropical, covering the region bordering the Pacific Coast and Caribbean Coast line, seaside cities of Cartagena and Barranquilla lie in this region which extends to altitudes of 3,300 feet. Tierra Templada, “temperate” lands, rise from 3300 to 6,600 feet, the cities of Cali and Medellin, lie in this region. Tierra Fria, “cold lands”, extends from 6,600 to 10,500 feet and where one will find the Capital of Colombia, Bogotá. Zona Forestada “forest lands” extend from 10,500 to 12,800 feet. Paramos, “flat pasture lands” are large flat pasture and grass lands found between 12,500 and 15,000 feet. Tierra Helado, ”land of Ice” located above 15,000 feet with temperatures below freezing, will find volcanoes and mountain peaks covered year round in snow and ice. Colombia, with native ancestors going back as far as 10,000 BC, was first discovered by Spanish explorers in 1499, Balboa and Spanish Conquistadors arriving in 1508, started their conquest of Colombia for Spain as they marched west. In 1513, Balboa was the first European to discover the Pacific Ocean, thus opening the continued march of the Conquistadors southward through Peru and Chile. Colombia finally won it independence from Spain in 1819. Colombia’s economy is based largely on the exportation of its natural resources, petroleum, coffee and coal. Manufactured goods as well as crops make up a good portion of exports. Tourism has seen a steady growth even with travel warnings regarding Colombia’s armed conflicts with Colombian rebels. Some of the more popular destinations being Bogotá, Cali, Medellin, Cartagena and San Andres Islands to name a few.